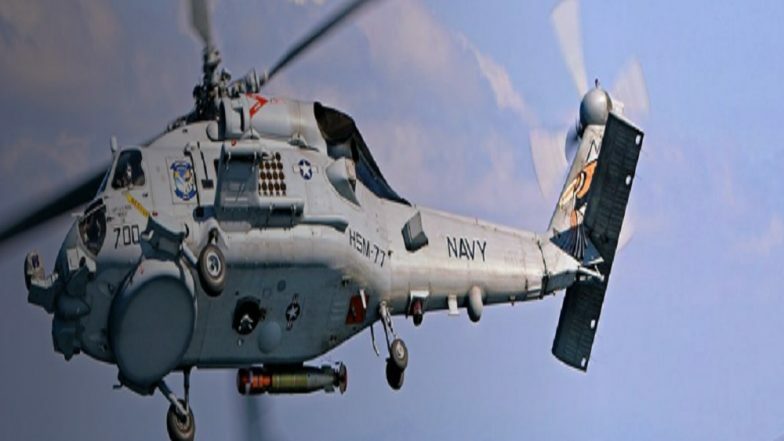 New Delhi, March 25: The Indian Navy is likely to conclude $2 billion deal with the United States (US)-based Lockheed Martin to procure 24 MH-60 'Romeo' Seahawk multirole naval helicopters by October this year, reported Financial Express. These helicopters are manufactured by Sikorsky-Lockheed Martin, under the US foreign military sales programme. The Navy will replace the fleet of Sea King Mk 42B/C and Ka-28 helicopters. India Set to Buy 24 MH-60 'Romeo' Helicopters From US, Deal Estimated at Rs 13,500 Crore. Meanwhile, in November last year, India issued a ‘letter of request’ to the US. These helicopters will be armed with torpedoes and missiles for robust anti-submarine warfare capabilities. The delivery of these choppers will start from 2020 and within two years, the entire process of procurement will be completed. The navy has a critical requirement of choppers to carry out important missions ranging from anti-submarine operations to fire support and early warning at sea. Chinook Helicopters Join Indian Air Force Fleet; Here's All You Need To Know About The CH-47F Heavy-Lift Chopper. Presently, the Navy operates 11 Kamov-28 and 17 Sea King ASW helicopters, but only four Kamove-28 and around five Sea King ASW are in flying condition. The MH-60 Seahawk helicopter is the world’s most advanced maritime helicopter. It is operational and deployed today with the U.S. Navy as the primary anti-submarine warfare anti-surface weapon system for Open Ocean and littoral zones. MH-60R is also capable naval helicopter to operate from frigates, destroyers, cruisers and aircraft carriers.